I won’t write about what prompted this post because it’s not my story to tell… but someone in my family suffered a serious setback which required several heart surgeries last month due to morbid obesity. It was a MAJOR wake up call that health should be the number one priority in all of our lives. My husband and I are on the same page. We want to be around for our children and for our grandchildren. This means that changes need to be made on a very broad scale right now. I have a pretty good foundation thankfully. I’m first generation and my mother and grandmother cooked very rustic and simple. Not a lot of processed / boxed goods growing up. Not a lot of sweets. Not a lot of fast food. Plus my aunt is a registered dietician. She lived in our house as well. So, I was surrounded with positive influence. Despite all of that, I gained 45 pounds with each of my children. But that was because I had to be SO inactive due to my complications. With 20 weeks of bedrest, I couldn’t HELP but gain weight. I don’t MOVE for 5 months. But both times – I was able to get the weight off. So, I do have some experience with getting back to my original form. In my head, I have several rules that I live by. These have worked for me and I KNOW these weight loss tips will work for you as well. Are you ready for my weight loss secrets? I am SURE that these will help you start shedding those pounds in 2013. Believe me – the SECOND I have this kid I will be right there with you. 2013 Weight Loss Secret #1: Brown your chicken with black tea instead of oil. Zero calories and it really works! I do this all the time. 2013 Weight Loss Secret #2: Eat protein during breakfast. Start off your day the right way. 2013 Weight Loss Secret #3: Break up your food into 5 segments. 3 Main meals and 2 snacks. This will prevent overeating during Breakfast, Lunch and Dinner. 2013 Weight Loss Secret #4: Stay active while doing mundane things. Are you washing the dishes? Stand on one foot. Brushing your teeth? Do some waist twists. Keep moving! 2013 Weight Loss Secret #5: Learn what a correct portion looks like. General rule of thumb? Carbs are about 1/2 cup. Yes… 1/2 cup!! 2013 Weight Loss Secret #6: Have a recipe that works for you? Save it! Either bookmark it on your computer, print it and throw it in a folder, or cut it out and make your own recipe book. This will really help you when you are having a crazy day and don’t know what to make for dinner. 2013 Weight Loss Secret #7: When you go out to eat, choose wisely AND be sure to only eat half of what is on your plate. You can enjoy the rest tomorrow for lunch. America’s portion sizes while dining out are as much as 4x the recommended value. CR-AZY! 2013 Weight Loss Secret #8: Make eating dinner a family affair. Turn the TV off. Talk to your spouse – your kids – your roommates. Be conscious when you eat. Focus on the food. I went to a Buddhist temple a few years ago and this was a lesson they drove into the group. Distractions are something you do NOT want while eating. I cannot tell you how many times I’ve caught myself POST-dessert NOT remembering that I actually ATE the dessert because I was distracted watching TV etc. Laugh all you want – but this is so true for me! 2013 Weight Loss Secret #9: Park further away from the store. This forces you to walk more than you normally would. 2013 Weight Loss Secret #10: Fall in love with spices. Healthy food does not have to be bland food. Have a little fun with fresh herbs and your grilled meals will taste great! 2013 Weight Loss Secret #11: Get the old school mentality of “finish everything on your plate” OUT OF YOUR HEAD and stop PUSHING it on your kids. When you are full… you are full. Save the rest or toss it. 2013 Weight Loss Secret #12: Are you a coffee drinker? Stay away from the cream and lighten up on the sugar! It might take a while to get used to… but you can save over 100 calories a CUP. 2013 Weight Loss Secret #13: How do you feel about green tea? Start getting used to drinking things without sugar or milk or artificial sweetener if possible. If green or black tea is just too tart for you – Starbucks has Passion Fruit tea that is naturally sweet and calorie free. It takes a little getting used to… but it’s worth it. I save about 500 calories a day by making the switch because I am a Trenta kinda girl. 2013 Weight Loss Secret #14: You have to exercise. You do. You can’t do this with just a diet change. Don’t have the money to join a gym? It’s ok – go for a brisk walk before work, during lunch or after work. Bring the kids along if you have any. This is harder in the winter I understand. But Spring is RIGHT around the corner. 2013 Weight Loss Secret #15: Looking for a crunchy snack? Grab a pickle! Not a sweetened pickle – a regular pickle. In fact – go for anything pickled! 2013 Weight Loss Secret #16: Think about why you are eating. Are you hungry? Are you sad? Are you stressed? Are you eating because it’s right there in front of you? Get down to the ROOT of your decision and take it from there. 2013 Weight Loss Secret #17: Stay away from temptation. When I am trying to lose weight I LITERALLY cannot go to a restaurant that serves fries because I know that I have ZERO control. If I see fries on a menu… I am going to order them with freaking gravy on top. Know your limits and respect them. Don’t bring home those chips if you know that you can’t help yourself. Food SPEAKS TO ME and I cannot resist when they start calling my name. So… I just don’t bring it in. 2013 Weight Loss Secret #18: Friday night pizza? That’s ok – make sure you take a napkin and blot the excess oil. I’ve been doing this for AGES. You can save up to 100 calories a slice. And don’t go for a second slice no matter how good it looks. Make sure you order a salad to help fill that belly! 2013 Weight Loss Secret #19: Eat at home. Stop ordering in. Stop going out. Start cooking meals for you and your family. Take complete control back! Don’t tell me you can’t do it – there are pressure cookers and crock pots that can ease this burden. I’m a mom. I work like CRAZY. I’m in your shoes. Plan ahead and it will all work out. There are websites out there that teach you how to freeze portions, cook for the entire week on a Sunday – etc. Google it. 2013 Weight Loss Secret #20: Be sure to eat breakfast every single day. This took a while for me to get used to but this morning meal jumpstarts your metabolism. You need to eat… even if it’s just a Greek yogurt and a small apple. 2013 Weight Loss Secret #21: Afraid of the gym? Think you can’t handle the machines yet? Not much of a walker? What about yoga? I am obsessed!!! It does a body (and soul) good. 2013 Weight Loss Secret #22: Get enough sleep people! You won’t make healthy decisions if you are exhausted and over-run. As a mom, this can be the TRUE TEST. How do we get around this? I don’t have the perfect answer – but when you can be sure to grab a few zzzzzs. And 8 hours at night is a MUST. 2013 Weight Loss Secret #23: Remember this is a marathon not a sprint!! You gained the weight over years and years. You will not get down to your goal weight in one month. TAKE YOUR TIME. 2013 Weight Loss Secret #24: No FAD DIETS! Please don’t get down with anything that sounds too good to be true. Please do NOT eliminate any of the main food groups. You have to eat a little bit of everything. This is LIFE. You NEED carbs – but make healthy carb decisions. This is a life change. This is NOT a diet. I hate that word. I really do. 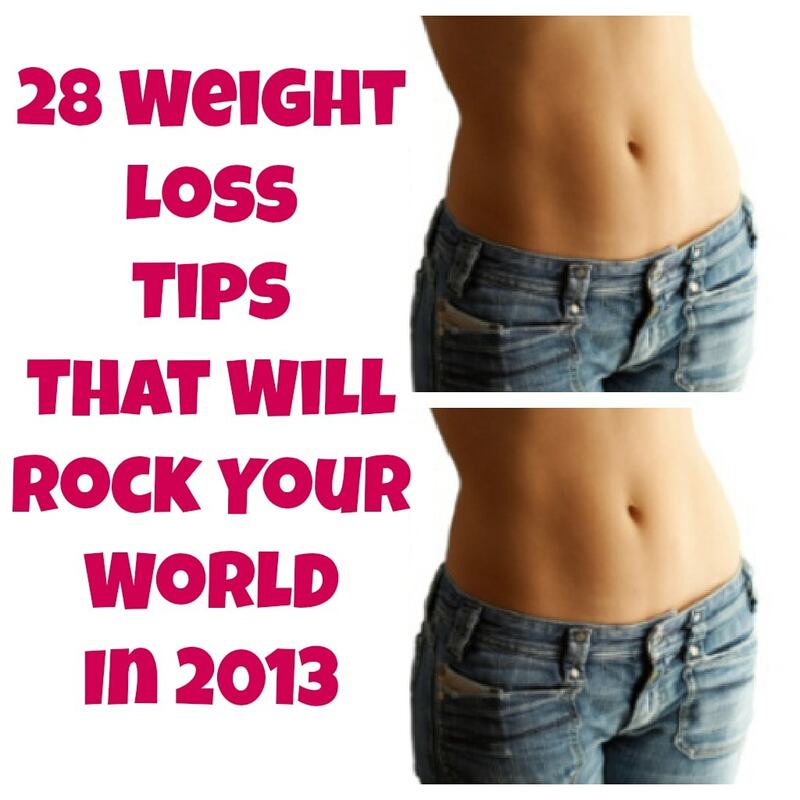 2013 Weight Loss Secret #25: This is the HARDEST ONE – are you ready?? Get the people that are in your life on board with the new you. You are only setting yourself up for failure if you are married to someone who loves fried chicken and fast food and has no intention of changing their eating habits. Your environment needs to change. Your surroundings will either make this really easy or really hard. My husband and I have decided to start taking better care of ourselves as a FAMILY and that will make it so much easier on both of us. Like I said earlier, I have ZERO self control. So, if my husband brings home something fried and delicious… you better believe I’m having some. Sorry but it’s true. By having him on board with my game plan, I know that I won’t have any extra temptation. 2013 Weight Loss Secret #26: Set a goal… but make it realistic! And don’t make a LONG TERM GOAL. Make short and OBTAINABLE goals. So what does that mean? Depending on how heavy you are – it could be just a few pounds a month. Maybe a pound or two lost a week at MOST. Don’t get yourself CRAZY. If you set yourself up to fail… YOU WILL FAIL. 2013 Weight Loss Secret #27: 90% of healthy eating is all about preparation. Have the right food in your pantry. Have your recipes in place. Have your snacks pre-portioned out. If it isn’t easy and readily available… you aren’t going to eat it. 2013 Weight Loss Secret #28: Last one folks — it’s ok to cheat. I’m not a nutritionist. I’m just someone that has lost 45 pounds twice after having my first two kids. I know what it means to lose weight. I know what it means to take it slow and steady. I know how hard it is to resist your favorites and I combat this by giving myself some cheat days. I NEED to have a Starbucks once in a while. I need to have chicken nachos with cheese once in a while. It’s life. There’s no end point. There’s not a moment where I’m going to STOP wanting to keep my figure. But I also KNOW that there will be days where I have to just let go. Parties, vacations, special occasions — LIFE. The point is to really take care of yourself on those average days. The average decisions that you make represent the MAJORITY of your life. So what you had a piece of birthday cake on your big day??? SO WHAT? But the next day… you better get back on that horse lady! This is it. It’s your life. Today is the day. Are you in? Previous Post: « Daily Diary: Puppets. Puppets. Everywhere. LOVE these tips! Wish you had used a different pic though. LOL I could do all these and STILL not have a stomach like that girl! Wow! This without a doubt is a great essay you’ve shown. Thank you for bothering to find your points and examine the documents you offered. I’m aiming to reveal this article with my audience, and I’ve subscribed to your feed to make sure I’m in a position to continue being up to date on your market. I completely really liked viewing the information your site blogged right now, and I’m pumped up about considerably more within the foreseeable future.